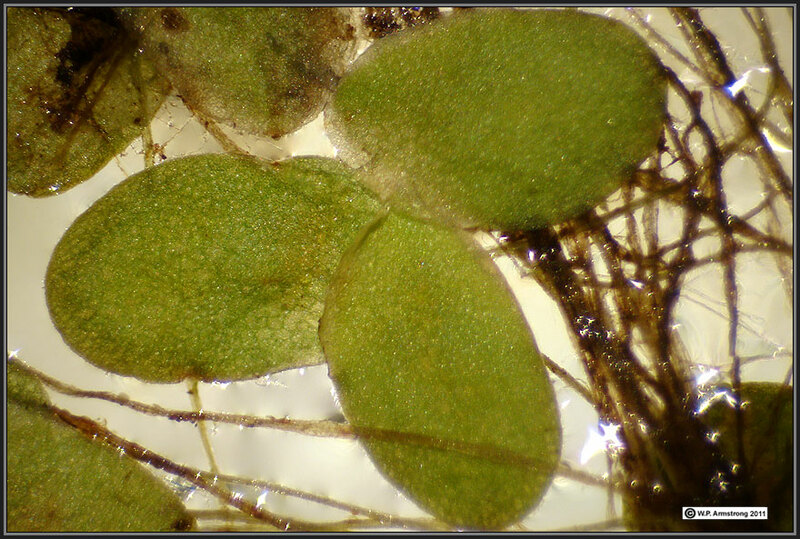 Herbarium specimens of duckweeds should be soaked (hydrated) in a small container of water. it is preferable to grow live specimens and observe them over a period of several weeks. A. Lemna minor? from unnamed lake N. of Pillager Lake. There are no distinct papules along midline of the upper surface. In addition there are no turions and no reddish anthocyanin on the underside of plant body. Most of the herbarium specimens I examined did not show discernible dorsal papules, unless these are all young L. turionifera (collected in June) that do not have well-developed papules. B. Lemna turionifera from Flaherty Lake: The upper surface has a row of very minute papules that are barely discernible on the lower plant body. This sample also shows a slight color difference. According to E. Landolt (1986) Veroff. Geobot. Inst. ETH, Stiftung Rubel 71 "The Family of Lemnaceae: A Monographic Study" (Vol. 1), L. minor is "rather frequent" and L. turionifera is "frequent" in Minnesota. A. Lemna minor? or young L. turionifera that does not have well-developed papules from unnamed lake N. of Pillager Lake. B. Lemna turionifera from Flaherty Lake. Same view as previous image only with a light background that shows the three main veins and air spaces (aereynchyma tissue) in both species. Lemna turionifera from Flaherty Lake showing several very minute papules along midline of dorsal surface. Lemna minor? 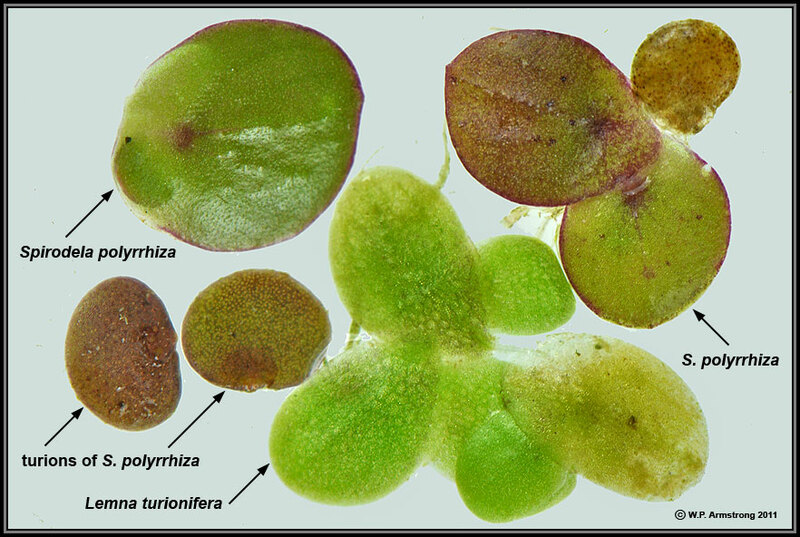 from unnamed lake N. of Pillager Lake: There are no turions and no reddish anthocyanin on the underside of plant body. The dorsal surface is smooth without a midline row of papules as in L. turionifera. Another hypothesis is this is L. turionifera that has not as yet developed papules. Lemnaceae from Sucker Lake (#10730): A. Spirodela polyrrhiza. B. Lemna trisulca. 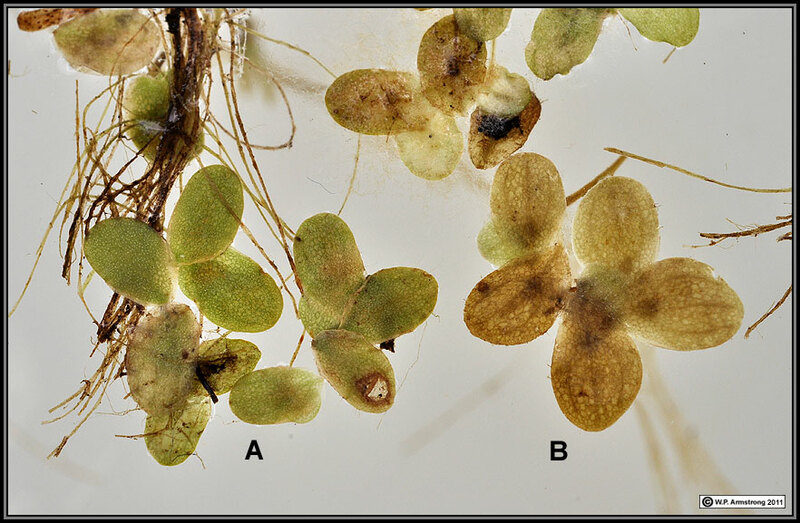 C. Upper photo has plant with barely-discernible dorsal papules and may be L. turionifera. Some of the plants in this collection also resemble L. minor, or possibly L. turionifera that has not developed papules. 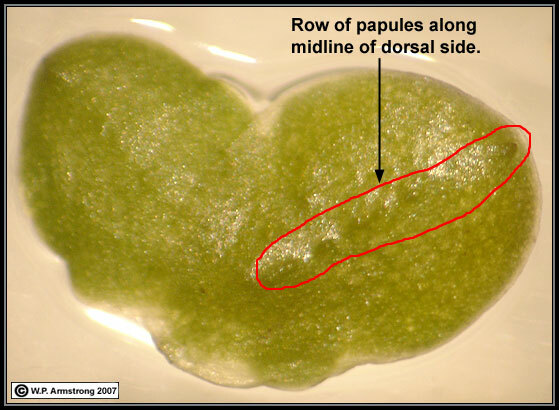 This 3-veined duckweed sample does not show the midline row of papules on dorsal side. It can still be identified as Lemna turionifera because the underside is suffused with red blotches, especially where the root is attached. L. minor typically does not have the red anthocyanin blotches on underside. 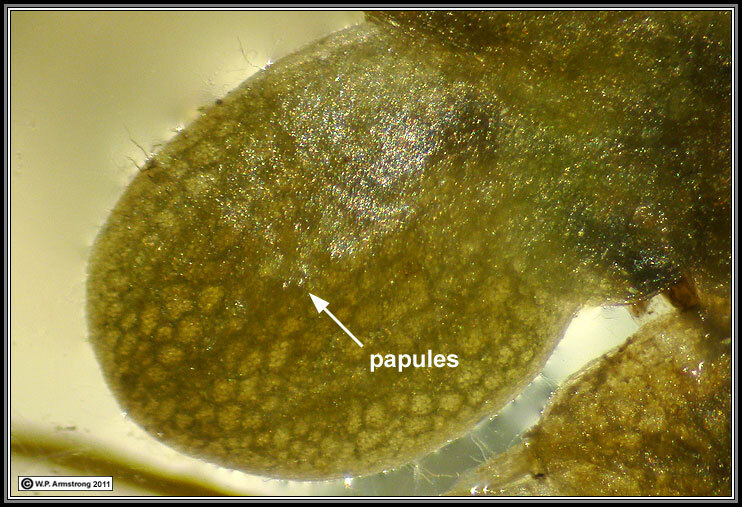 It does not have the large apical papule of L. obscura or the winged root sheath of L. perpusilla. Most of the Lemna in this collection had minute papules. 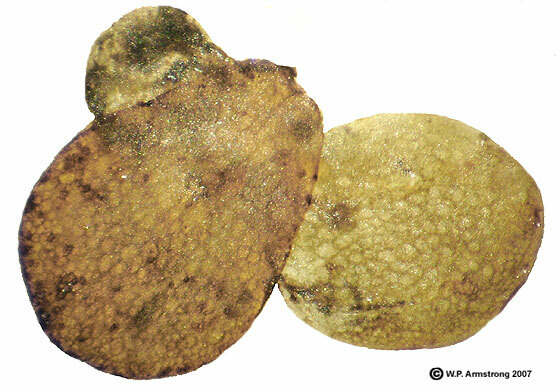 Nongibbous L. gibba is probably unlikely because most of the Lemna plants can be identified as L. turionifera. The collection also contained L. trisulca and Spirodela polyrrhiza. Lemna turionifera: Although they are minute, the dorsal midline row of papules are visible. 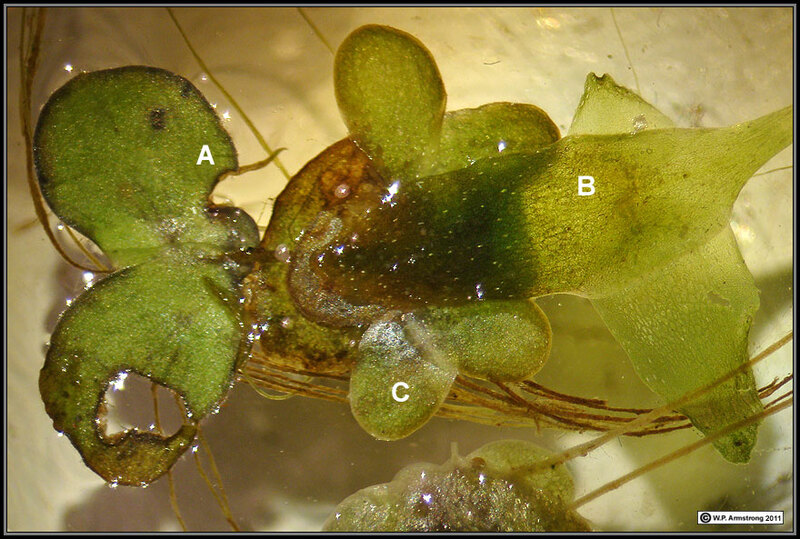 Spirodela polyrrhiza with turions and Lemna turionifera with minute dorsal papules. Lemna turionifera has three main veins and is superficially similar to L. minor and nongibbous L. gibba. It differs from L. minor and L. gibba in having a row of 3-7 minute papules along the midline of the dorsal surface. What really sets this species apart from other duckweeds is the presence of rootless, overwintering turions in the fall months. These are referred to as "winter buds" in the Jepson Manual of California Plants (1996). 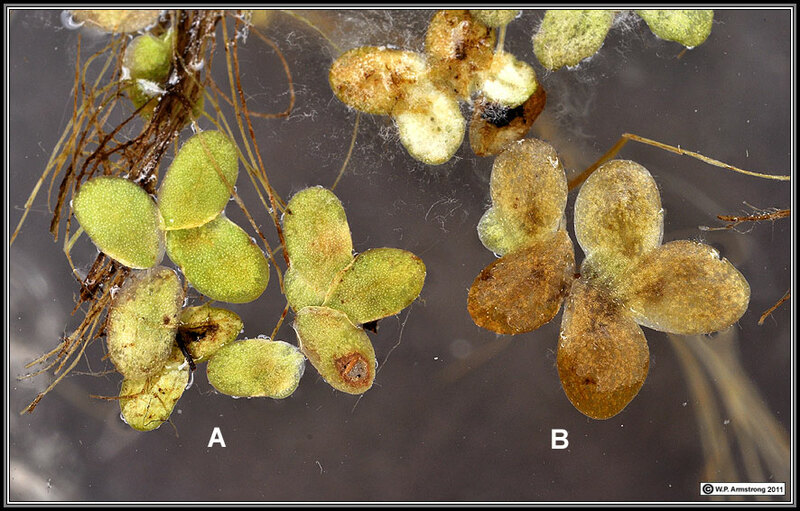 Lemna turionifera appears to be more common than L. minor in San Diego County. It generally replaces L. gibba in the higher elevations. 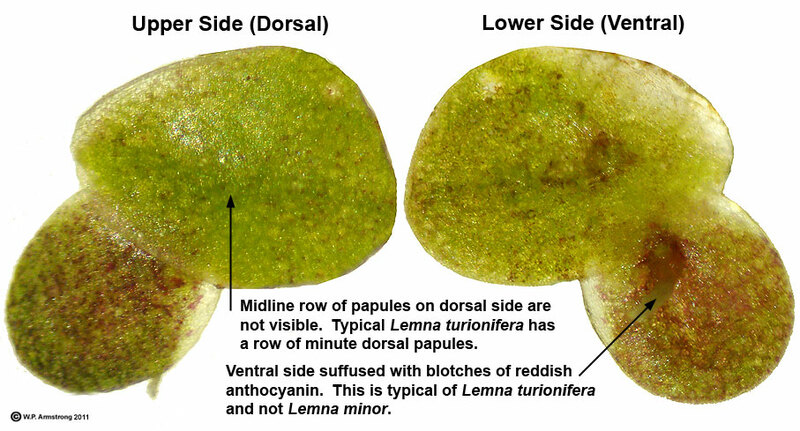 Lemna turionifera: View of dorsal surface showing row of minute papules along the midline. This row of papules is absent in L. minor and L. gibba; however, L. gibba may have an apical papule and slight dorsal ridge along the midline. 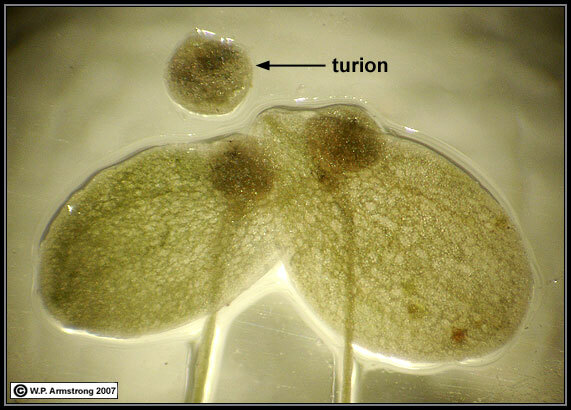 Lemna turionifera: Overwintering turions are produced in the lateral budding pouches. They are essentially small, dark-colored, rootless, starch-filled daughter plants. They are called "winter buds" in the Jepson Manual (1996). Because starch has a specific gravity of about 1.5, the turions sink to the bottom of quiet streams and ponds during the fall where they survive the freezing winter months. In the spring when the temperatures are once again suitable for growth, the turions produce bubbles of carbon dioxide and rise to the surface. They give rise to daughter plants by budding, and soon clonal colonies of this remarkable duckweed once again cover the water surface. It is very doubtful that nongibbous Lemna gibba is in these collections from Minnesota; however, in California and Baja California this is another very confusing North American species that could be misidentified as L. minor. 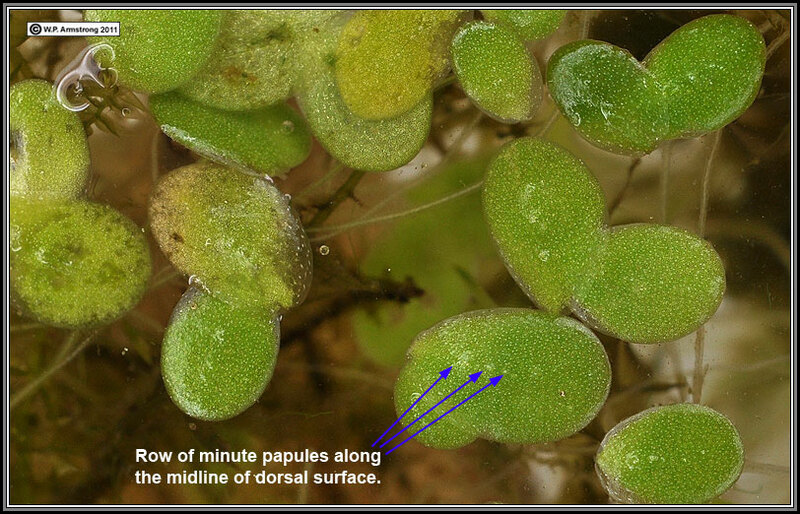 I mention it here to show how difficult some duckweed identifications can be. Even noted authorities disagree on the separation of these two duckweed species. Lemna (SD79566) collected by Reid Moran and Robert F. Thorne at La Encantada in the Sierra San Pedro Mártir, Baja California (19 Aug. 1967). It was originally labeled L. minor and later determined by E. Landolt to be L. gibba. This collection apparently has intermediate forms that resemble L. minor and nongibbous L. gibba. The lack of a row of papules along the midline of dorsal side probably rules out L. turionifera, although the latter species would be expected at this elevation. The air spaces seem too small for typical L. gibba; however, the pattern and shape of air spaces resembles L. gibba. Nongibbous forms of the latter species have air spaces similar in size to L. minor. In addition, Lemna minor sometimes has a slightly more elongate plant body with a length/width ratio greater than 3/2. Plants of L. gibba often have a more orbicular body with an asymmetrical apex. The upper and lower surface may be suffused with reddish anthocyanin, a color trait that is typically not shared by L. minor. The problem is that all of these morphological characteristics, including size, shape, gibbosity and pigmentation, are influenced by environmental conditions. Lemna gibba often grows in high nutrient ponds, including stagnant water with rich, black mud. In San Diego County, I typically find this species in the coastal areas. 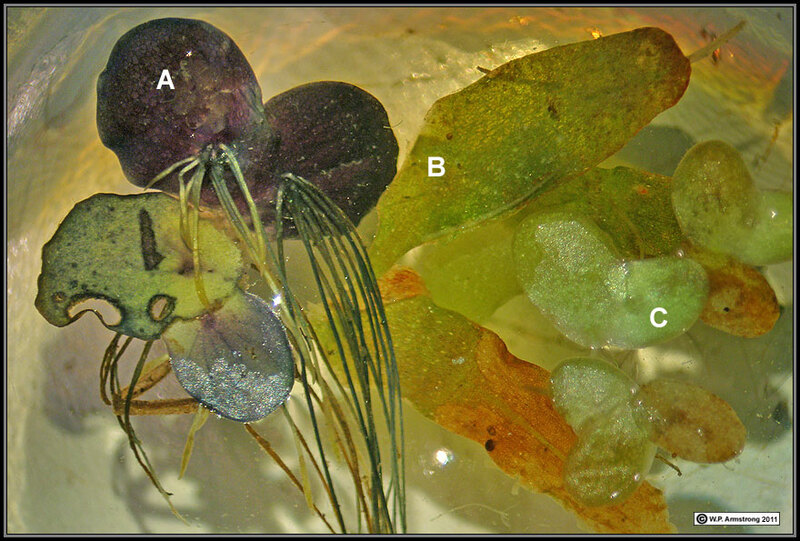 Without air spaces that are greater than 0.3 mm in diameter or another trait such as reddish anthocyanin, I'm afraid that I am unable to separate borderline duckweeds intermediate between L. minor and nongibbous L. gibba with 100% certainty. The following quote was taken from page 362 of "Morphological Differentiation and Geographical Distribution of the Lemna gibba-Lemna minor Group" by Elias Landolt (Aquatic Botany 1: 345-363, 1975). "... we have to admit, even for specialists, it is often very difficult to determine plants belonging to the group of L. gibba-L. minor. As in other critical species groups, we are able to recognize a given species only if the plants are in a suitable developmental stage and if the range of variation is verified experimentally." This is precisely why I prefer to work with live specimens that I can grow and observe carefully over a period of several weeks.